[Discussion] What's your fav Habbo clothes?? Thread: What's your fav Habbo clothes?? 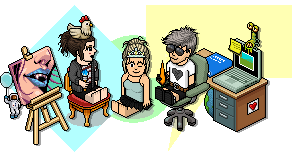 What's your fav Habbo clothes?? As the thread title says!! What's your fav/least fav Habbo clothing?? I literally don't wear anything other than the default clothing as my look is a 2011 original but I would say my favourite piece of clothing that I've SEEN is one of the floral crowns, they're just really cool looking and really contemporary compared to some of the other silly things. NGL, I like all of them - since I try and get almost every single item of clothing there is... However, I currently don't have a favourite item of clothing. Moral of the story: Goldfish hats. The 30c ones. My favourite clothing hasn't really changed much, I guess I always find myself going back to the older HC clothing and I don't really like the newest stuff. I don't really have a look that I always wear but when I change my look I always use the same items and just mix and match them and the colours. The other day I got HC on my first account for the first time in years and was able to look at the saved outfits, and they were all basically the same stuff I wear now! So I guess that's what I like. Although I do wear the flower crown now because it's cute.